I like big salads and I cannot lie! I love a big salad! The combination of greens, fruit, and protein makes for one happy girl! I also like looking at my plate and seeing almost every ingredient from a local vendor! Making salad dressing is really simple, and when you make your own dressing you don’t have to worry about the nasty fillers and preservatives in store-bought dressing! 1. Make your dressing! Whisk the balsamic vinegar, olive oil, Dijon mustard and spice together; and set aside. 2. Toss spinach in about 1 tablespoon of dressing (if you like more dressing, feel free to add more! I prefer my salad lightly drizzled, not drenched). 3. 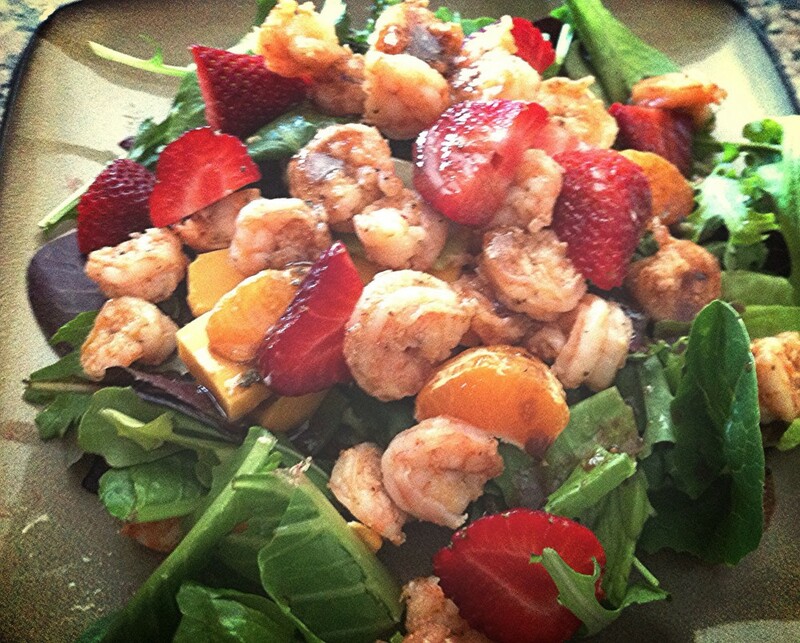 Sprinkle strawberries, orange slices and shrimp over salad.